The world has indeed gone mobile with the help of the powerful handheld computers we call smartphones and tablets. And, thanks to the millions of apps now available for iOS and Android devices, we have moved beyond the everyday wonders of wireless calls, emails and text messages to managing a seemingly limitless range of activities, both on and off the job. Action-based functionality is at the core of TMW’s own mobility strategy. The company recently launched a comprehensive mobile platform that brings highly targeted, role-specific capabilities to key participants at every level of a transportation business. TMW Go Dispatcher, with full order-to-cash functionality for users of the TMW.Suite platform. Leading features include adding/viewing check calls, issuing advances, updating stops, assigning resources, running reports, splitting trips and more. TMW Go Driver enables vehicle operators to review trip, pay and appointment data. 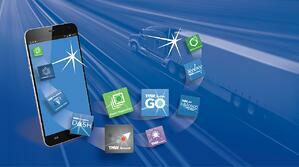 TruckMate DASH Dispatcher, an order-to-cash solution for the TruckMate TMS. Users can monitor status changes, manage exceptions, approve advance requests, track resources, visualize and map trips, and more. TruckMate DASH Driver offers access to daily trip schedule and detail, pay information, mapping and important notifications. Drivers also can use the app to request advances. TMW IES InMotion Dispatcher, for the Innovative IES, Access and Access Plus TMS platforms. Capabilities include reviewing and accepting/rejecting EDI shipments, entering call checks, reviewing driver information, issuing advances to drivers, tracking and tracing customer orders and more. TMW IES InMotion Driver allows users to review trip details, read messages, monitor Hours of Service, view paycheck information, upload photos of receipts and view their current route on a map. TL2000 Away Dispatcher, for TL2000 TMS users. This new mobile tool allows dispatchers to complete most daily tasks, including facilitating load updates in real time. TMW Asset Inspection app, which enables drivers to quickly and easily perform pre- and post-trip inspections, review prior inspection reports and confirm that appropriate repairs have been completed. The app connects with TMT Fleet Maintenance software to streamline the creation of accurate repair orders and help reduce vehicle downtime. TMW Parts Room app, which enables fleet maintenance and service center personnel to perform a variety of parts inventory management processes. TMT Mobile Mechanic, an app that can be used to track labor and parts usage, open repair orders and forward information to TMT Fleet Maintenance software. TMW TruckMate ConnectedDock for cross-dock operations. This app streamlines unloading and receiving processes; data collection and documentation based on dimensions, weight, pieces and pallet; and loading for through trips and partial unloads. Learn.TMW, which helps users quickly search for and access any of the more than 300 videos and other training resources available through the Learn.TMW web portal. Access TMW apps on Google Play: https://play.google.com/store/apps/developer?id=TMW+Systems+Inc. Access TMW apps on ITunes: https://itunes.apple.com/us/developer/tmw-systems-inc/id953980473 In addition to these new apps, TMW has optimized both its Reveal Series business intelligence (www.tmwbi.com) and www.TruckLoadRate.com market intelligence resources for mobile browsers. Explore all the benefits of a mobile app strategy and what technology can do for your transportation services business, call us (800) 401-6682.